Although the people in Kashmir always feel more oppressed on August 15 every year, this year it was extraordinary. The state of unfreedom was at its peak, the curbs on movement unprecedented, the gag on communication unrealistic and the pressure on government colossal. On August 15, the ‘democratically elected’ government in Jammu and Kashmir celebrated the Indian Independence Day across the state, including Kashmir valley. The main function was held at Bakshi Stadium in uptown Srinagar and the event was presided over by Chief Minister Mehbooba Mufti. Unlike the festivity in other states of India, the day was not peaceful in Kashmir valley. It has never been peaceful earlier either. This does not mean the day is marked with armed battles or stone-pelting clashes, but no civilian has peace of mind. People never accept anything forced on them and a country forcing its independence day on people who demand their own independence from them is bizarre. As India celebrated its 69th year of independence, the ongoing unrest in Kashmir valley kept getting worse. People in Kashmir rose en mass after Indian armed forces shot dead popular armed separatist commander Burhan Muzaffar Wani on July 8 and the following violent protests led to nearly 58 deaths and left over 5,000 injured. Pakistan celebrates its independence day on August 14 and India celebrates the next day. But both days are the same for the people in Kashmir. People continue to demand ‘azadi’ (freedom) from the foreign rule. The separatist leaders call for a complete shutdown on August 15 and ask people to observe it as a ‘black day’. They also call for observing August 14 as ‘Pakistan day’. So, in essence, none of the two days is observed by people as independence day in Kashmir. The more the cry for ‘azadi’ resonates in Kashmir, the more people witness its absence. The more India adopts a hardline approach over Kashmir issue, the more unfreedom is inflicted in the region. Only three days before India was scheduled to celebrate its independence day, the people in Kashmir lost their freedom to communicate. On August 11, authorities directed all private mobile telecom operators to snap their networks for the second time in a month. The mobile networks resumed the next day but were snapped again the same evening. This time, the government took a step ahead and snapped broadband internet services by the state-owned Bharat Sanchar Nigam Limited (BSNL), which was the only working internet service since the last 35 days. The move largely affected media and the communication crackdown was at its height this time since the agitation started on July 8. The separatist leaders had called for a “referendum march” to Lal Chowk, Srinagar, on Friday and Saturday, asking people to reach the venue or stage sit-ins wherever they are stopped by government forces. The government forces imposed curfew around the venue, detained separatist leaders and used lethal force on protesters. Communication blockage is a very serious concern, but more serious is the unprecedented curb on movement. Although government imposes curfew on the pretext of preventing a militant attack, its underlying motto is obviously to disallow people from protesting against the Indian rule. What came as a surprise on August 13 was to see the armed forces denying access to journalists who possessed curfew passes issued by the state administration. Local newspapers carried front-page stories the next day, quoting armed forces, including the state police, saying they did not recognise Srinagar’s district magistrate as an authority, adding that they only accept curfew passes issued by the Government of India. Some journalists could not reach their offices in the press enclave, near Lal Chowk, while many others stationed outside Srinagar could not send news copies over the Internet. Today, Modi addressed the nation from Red Fort in capital New Delhi. He praised his government’s work in the last two years, but made no unambiguous mention of the present unrest in Kashmir. Head of the Indian state, which calls Kashmir its “integral part”, referred to the people of Pakistan’s Kashmir, Baluchistan and Gilgit, instead of the people in Indian Kashmir, who were caged in their houses as Modi’s India celebrate independence day. Moreover, he appealed to young adults who had picked up arms, calling them “terrorists” and demanding they give up arms and return back. He asked them to think about the dreams of their parents. However, in the case of Kashmir, the Prime Minister has perhaps not heard what parents of young militants say. For instance, Burhan’s father has on camera spoken in support of his son’s ‘struggle’. Similarly, when over 100,000 civilians assembled in Tral town for Burhan’s funeral, men chanted the slogan, “Tum ek Burhan maarogay” (You will kill one Burhan), and the women raised their voice in unity, “Har ghar se Burhan niklega” (Burhan will come out of every house). But there was no reaction or condemnation to indiscriminate use of pellet guns by Indian forces, which is supposedly a non-lethal weapon, but has blinded over 150 civilians, including children as young as five, and has left scores of others with critical injuries since July 8. Pertinently, when Modi broke his silence after 31 days of unrest in Kashmir, he said stones were being handed over to the youth, who should have been holding laptops. That time too, he did not talk about lethal pellet guns being handed over to the forces who should have been there for the security of people. In Srinagar, chief minister Mehbooba said “guns would not resolve any issue”. She said this at the independence day function at Bakshi Stadium, which is at only a ten-minute drive from Nowhatta area in downtown Srinagar where two militants opened fire on paramilitary forces and engaged them in a gunfight. The two militants and an officer of Central Reserve Police Force (CRPF) were killed while eight security personnel were injured in the encounter. “Whether the gun is of militants or ours, gun won’t solve anything,” said Mehbooba. She expressed hope that Modi would carry forward the initiative taken by former Prime Minister Atal Bihari Vajpayee, who advocated and initiated a dialogue process in his regime. But use of gun continues unabated across Kashmir. According to the government and police, there are not more than 200 armed militants active in Kashmir. However, at the same time, India continues to station its army, estimated to be over 500,000 in number, in Kashmir. The guns, on the other hand, are not only used against the armed militants, but also widely used on protesting civilians and stone pelters. Over 55 protesters were killed in the ongoing civil uprising, with many of them having received critical firearm injuries. 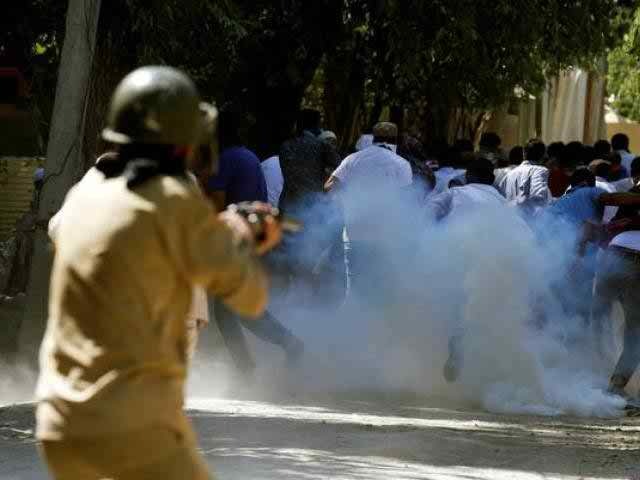 One of such firing incidents took place in Qazigund area of South Kashmir, where army opened fire on protesting civilians, killing three, including two women. Even though Mehbooba repeatedly advocates dialogue as a solution, unarmed separatist leaders of Kashmir continue to be under house detention while the government has made no effort to initiate a dialogue process with them. In fact, the Indian government does not even consider separatists as stakeholders in Kashmir. India makes soaring claims about its independence from the colonial British rule while the people in Kashmir continue to seek independence from the oppressive Indian rule. 0 Response to "More curbs imposed in Kashmir as India celebrates its independence day"